There's no strip-teasing - DDMF's latest plugin is available right now. 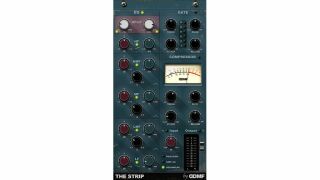 DDMF has already released several acclaimed EQ and compressor plugins, and it's now used its processing know-how to create a complete channel strip plugin. Known, simply, as The Strip, this bundles an EQ, a gate and a compressor into one effect, and because of its low CPU usage, DDMF reckons you can comfortably stick it onto every channel of your project. Specs are below, and you can find out more and download a demo on the DDMF website. The Strip is available now for the introductory price of $39 (this will rise to $49 in October).